One of the most important aspects of any storage solutions, involves utilizing hardware to its advantage. Many storage vendors have taken advantage of faster drives and other technologies to create fast storage solutions, and vSAN is no different. We will discuss why it is so important for vSAN to have compatible/supported hardware and how to check this. One of the main requirements for VMware’s HCI solution is for hardware to be on its Hardware Compatibility List (HCL), also known as VMware Compatibility Guide (VCG). This compatibility guide will allow you to check existing hardware and/or hardware that you plan to purchase for vSAN. You can also check vSAN ready nodes against this guide. Before you deploy vSAN, all hardware must have passed the compatibility test. This is to ensure that the best performance will be achieved, as well as reducing possible issues due to hardware. Hardware compatibility with vSAN includes but not limited to hard drives (MD), flash devices, storage controllers, etc. It is not only necessary for the hardware to be on the compatibility list, but also have the appropriate firmware and driver versions for the specific version of ESXi. You can also check compatibility of vSAN ready nodes at this site. Once vSAN has been deployed, vSAN will check your hardware compatibility against the downloaded VCG version. You can also update the local VCG version from the Web UI. To make sure the HCL DB is up to date on your cluster go to Cluster>Manage>Settings>Health and Performance from the Web UI. You can update the list by clicking on the “Get latest version online”. If your hardware/firmware/drivers are not compatible with the VCG, you will get a warning/error. Once downloaded extract it on a window system, open command prompt and navigate to the location of the folder. Launch hclCheck with the necessary flags (e.g. –hostname, –help, etc.). In my case, I did this on my home lab, I am using self-signed certs so I had to use –noSSLVerify flag. 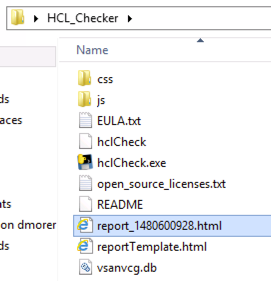 Notice that this tool will download the latest version of the HCL DB and check against it. After a few seconds, the check is completed and a report is created on the current directory. Double click on the file to open the report on your default browser. One important piece to notice here is that the report also includes the PCI IDs for the device. So what? you may ask. Well, this can be used to check against the VCG, and get the correct firmware and driver info. If the VCG shows multiple instance of the same controller, SSD, etc., check the PCI IDs to pick the correct one and get the recommended driver and firmware version. In this report, you can see that my home lab hardware is not supported for vSAN… it works, but not supported. Example of multiple entries on VCG. Notice different SSID (Sub-device ID). ← HCIBench null Results? But it worked last week? !